Thank you to all the wonderful entries into my challenge this week. We are very blessed to have you play along with us week after week and we do appreciate it. I liked the paper piecing on this one as well as the non-traditional harvest colors. 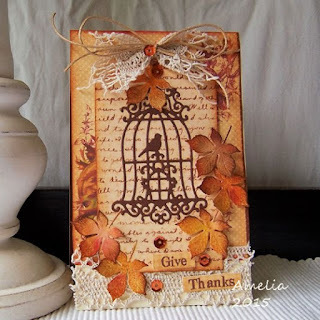 Another project with great layers and textures and I loved the vintage feel~! Congratulations ladies, please grab your blog badge from the sidebar. A big thankyou to everyone who played along with us. Please join us tomorrow for our next challenge. 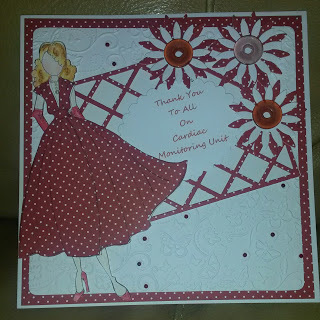 Thank you so much for choosing my card as one of the challenge highlights. I am proud to display my "Use Your Stuff" badge on my blog! I just added the "Use Your Stuff" badge to the sidebar of my blog. I'm so happy you liked my card.